Note: The average conversion rate above is based on 15 studies, most of which were published over the last 5 years. By and large, we have excluded data that is anomalous and/or redundant due to age (usually older than 10 years). This list (and the average) is updated as new data is published. or worse than your competitors? Please enter conversion rate value. We dug into 8 years of our experience and put all our insights into one ebook. The content that you’ve just requested is waiting for you in your inbox. Or here. Schedule a free 1:1 webinar where you will learn about conversion bottlenecks of your online store, get proven recommendtations and the guearanteed revenue targets we can deliver for you. 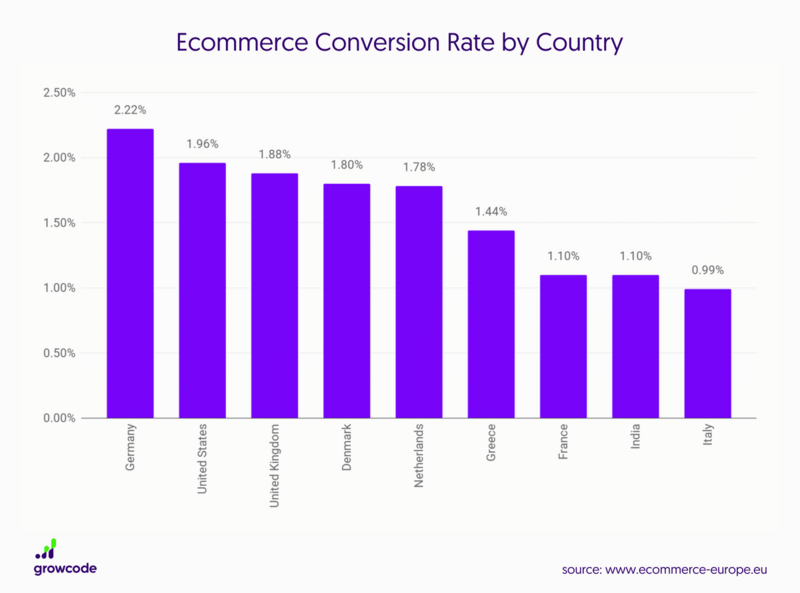 As an ecommerce retailer, you’ve probably wondered how your website conversion rate stacks up. You’re also likely a tad frustrated at the conflicting data available, not to mention the fact it can be difficult to get hold of in the first place! 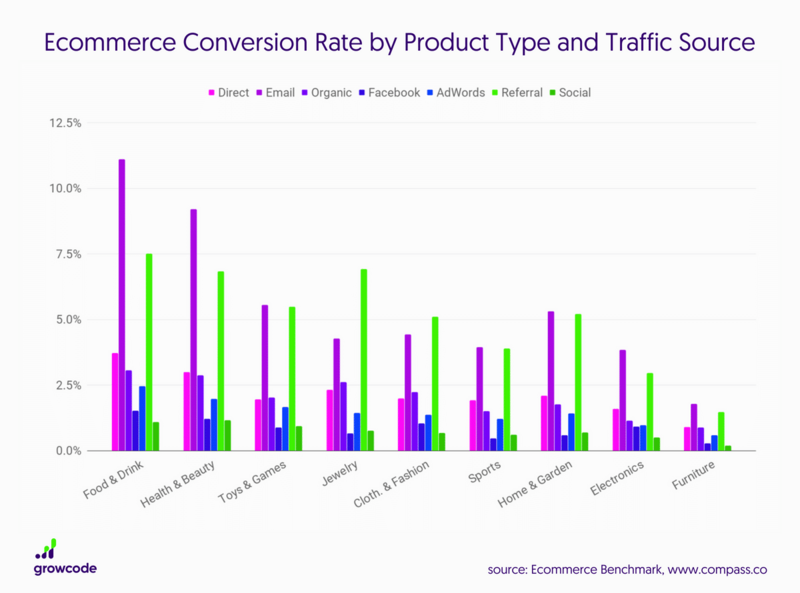 In this post, we’ve compiled the best recent case studies, roundups and benchmarks to give you a definitive ecommerce conversion rate average. The data covers rates across a number of industries from the early 2010s to the present day. What’s more, we’ve also found the most important studies of conversion rates regarding specific segments, like devices, countries and referral channels. 2. Is Conversion Rate Important? 3. How Is Website Conversion Rate Calculated? 4. What’s a Good Conversion Rate? Have we missed some important data? If you know of research that isn’t included, please get in touch at pawel.ogonowski@growcode.com. 16. 2.35% Wordstream (2014) – Study of conversion rates of landing pages by Wordstream. 17. 8% Mixpanel (2017) – Excluded as anomalous. 18. 0.59% Demac Media (2016) – Conversion rate of sessions of first-time visitors. 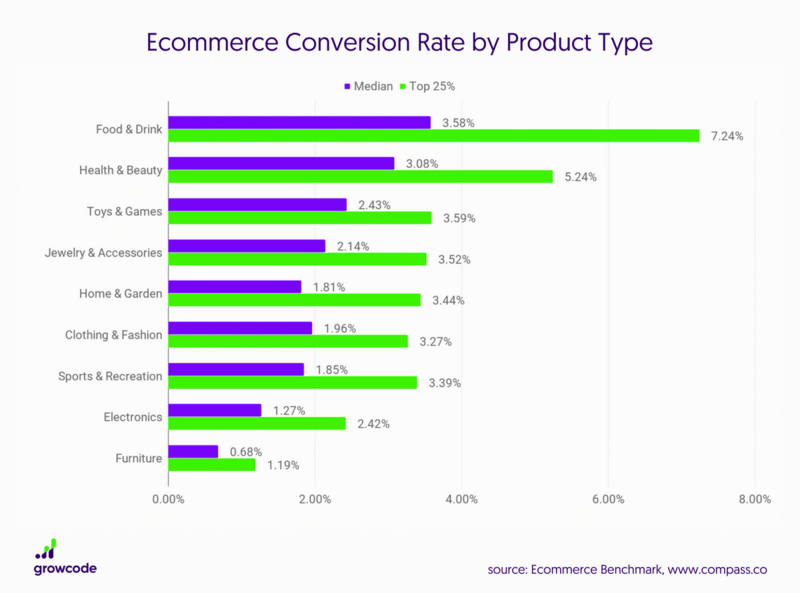 Is Ecommerce Conversion Rate an Important Metric? There’s an ongoing argument about the importance of conversion rates. We’ve even published a post about why conversion rate shouldn’t be the primary metric you seek to improve through your optimization campaigns. Conversion rates vary so much across verticals that comparing one store or market to another often won’t produce any meaningful insights. An apparel website, for instance, will most likely have drastically different metrics to a B2B-focused supplier of industrial materials. That said, conversion rates aren’t going away. And there’s a simple reason. When used in conjunction with other important metrics, they can be an excellent barometer of the “health” and competitiveness of an online store. Just be careful about how you use third-party benchmarks. Always formulate your own KPIs based on data from your competitors (wherever possible), specific markets and in-house analytics (btw find out our post about must-have ecommerce Google Analytisc analytics reports). At Growcode, we regularly consult a number of excellent sources, which draw either on their own subscriber data or third-party data. If you’re eager to ensure your own benchmarks are up-to-date, they’re worth keeping track of. IRP Commerce – IRP Commerce publishes real-time ecommerce data about a number of industries and segments on the “ecommerce market data” section of their site. Most key metrics, including conversion rates, are included. Compass – Compass is an analytics company that regularly publishes ecommerce benchmarks based on the aggregated data of the customers that use its app. Monetate – Monetate is an optimization platform that, like Compass, publishes benchmark reports and research studies. The quarterly benchmark report that will be of particular interest to online retailers. Wolfgang Digital – Wolfgang Digital is a digital marketing company that has published several interesting studies in the past, including a major 2017 benchmark report that has been widely cited across the web. Statista – In terms of broad, easy-to-consume data, Statista is still the leader. The site is responsible for wide-ranging materials about ecommerce and constitutes an excellent source for retailers that want to keep their finger on the pulse of the global market. How is Ecommerce Website Conversion Rate Calculated? The calculation for measuring the overall conversion rate of an Ecommerce store is widely accepted and well-understood. Conversion rate = Sessions with transactions / Total sessions. Note the use of “sessions” rather than unique visitors. A session refers to a visit by an individual within a given time period, often 30 minutes. If a customer visits twice during the same period, it will count as one session. If, as in the example above, a customer visits again, after a thirty minute period has elapsed, the second visit will be recorded as a separate session. A “session” is a superior indicator of buyer intent, as opposed to a unique visitor, because it comprises a self-contained shopping “event”. The same customer may visit a store multiple times during a certain period, with each visit representing an opportunity to make a sale for the online retailer. There are significant conversion rate disparities between industries, countries, seasons, devices and more. For July 2018, for example, the typical conversion rate for the clothing and accessories market was 1.41%. Compare that to 0.58% for agricultural supplies. With that in mind, it’s best to develop your own key performance indicators (KPIs) by looking at the average ecommerce conversion rate in your industry, taking into account your own data as much as possible, while allowing for anomalies. What’s more, you should always be careful when making comparisons to competitors. Amazon, for instance, boasts a 13% conversion rate, which is almost seven times the industry average. Also, understand that there can be reasonable differences between stores in the same industry – a clothes retailer targeting younger people will likely have a sizeable difference in its overall website conversion rate when compared to a store catering to an older market. Third party metrics, medians, averages etc. are great for giving you a general idea of what to aim for. They also highlight the places you might be running into issues (such as on mobile devices), and help to measure yourself against close competitors. So what’s a good website conversion rate? Assuming you’re not hitting well below your market average, and accounting for natural and manmade disasters, it’s simply one that’s better than the last one! Sorry we couldn’t be more specific folks! When developing goals and in-house benchmarks, we’ve found market-specific conversion rate standards to be a valuable source of data for gauging the general performance of an Ecommerce store. IRP Commerce provides timely data about a number of markets. You can see from the graph below – summarizing conversion rates for December 2018 – that “Arts & Crafts” leads the way with 3.83%% while “Baby & Child” lags behind with 0.84%. Recent median data from Compass also presents interesting data giving us some additional peek into the how conversion rate is distributed in every Industry. It’s important to take benchmark conversion rates of individual countries into account when formulating your own KPIs. The conversion rate you should expect from an Indian market, for example, will be different to that of a US market. It can be particularly useful to come up with language and country-specific KPIs for segments of your customer base. It might also be necessary to amend KPIs based on industry benchmarks if you’re catering to a market with a lower overall conversion rate. As always, the key here is for these stats to inform your goals not to define them. 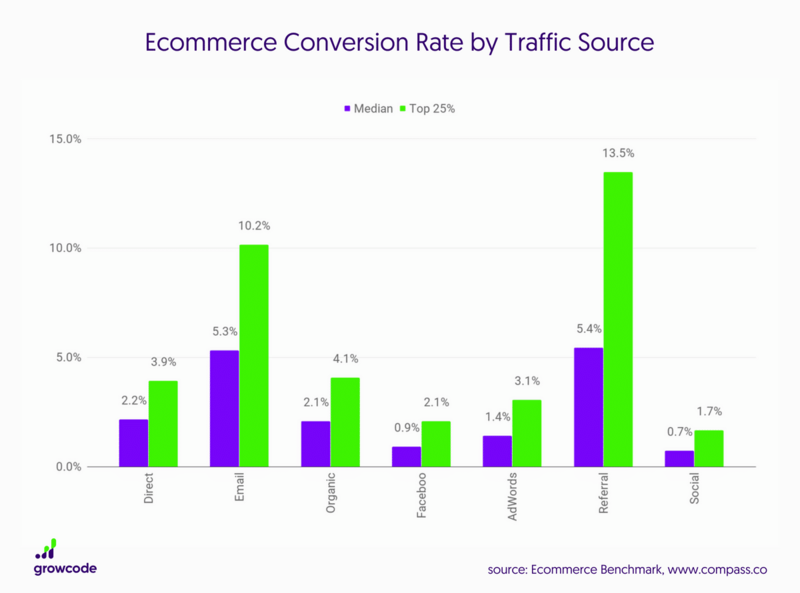 Ecommerce conversion rates by traffic source are incredibly useful to retailers because the figures can be used to set channel-specific goals while also honing in on the most promising and best-performing sources of traffic. Referral traffic is by far the best performer and highlights the need among ecommerce retailers to encourage. Benchmarks for specific devices – namely desktop, tablet and smartphone – are also worth considering when forming specific KPIs. As is clear from the data below, conversion rates for large-screen devices like tablets and computers are significantly higher (more than double) than the conversion rate for mobile. This information can help you form an accurate picture of how you’re performing on different devices. A low desktop conversion when compared to mobile, for example, might indicate issues with your desktop site design. An extremely low mobile conversion rate, on the other hand, likely points to a poorly-designed mobile shopping experience and checkout. Find out how to boost mobile conversion rate by stealing ideas form Asos.com! Navigating the world of online data is difficult and complex. Dozens, if not hundreds, of new ecommerce studies – covering a range of metrics – are published every year. Which should you give your attention to and which should you ignore? At Growcode, we believe it’s best to take a focused approach. We advise our clients to rely on a handful of well-researched studies, picked because they cover a range of metrics deemed to be relevant to their own KPIs. It’s important to remember that the role of benchmarks is to help you better understand your own performance and goals and shape your optimization strategy. They’re not gold standards to be replicated. What’s more, it’s always best to take as nuanced an approach as possible, accounting for both general metrics, such as average by country, along with specific metrics, such as conversion rate by industry. Growth Hack Your Ecommerce Conversion Rate, Sales and Profits! Download this in-depth, 115-point ecommerce optimization ebook and get a thorough understanding of all the on-site elements you need to improve to growth hack your conversion rate, average order value, sales and profits (and of course, how to do it).